The ocean's largest creatures are at risk from the tiniest plastic particles. Typically when we think of marine plastic pollution, images of turtles caught in plastic six-pack rings or seabirds choking on floating plastic debris come to mind. But that plastic doesn’t have to be visible to naked eye to have detrimental impacts. A new study found that the smallest plastic particles can affect the largest ocean animals. Researchers from the U.S., Australia, and Italy wrote that some whale and shark species are at risk from microplastic pollution — minuscule particles of plastics that float, unseen, in oceans worldwide. 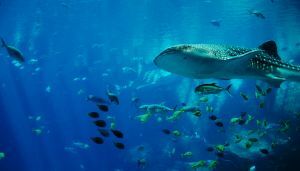 The study, published in the journal Trends in Ecology and Evolution, revealed that marine animals like whale sharks, basking sharks, and other filter-feeders are ingesting tiny plastic particles that can block their ability to absorb nutrients. These particles could have toxic side effects too. Filter-feeders include baleen whale species, like Humpbacks, Grey whales and Blue whales, that have no teeth. Instead the baleen whales have a keratin-based filter that they use to strain food like krill and plankton out of the water. These animals sometimes imbibe thousands of cubic meters of seawater a day in order to get their fill of plankton. Now, the researchers discovered that while the filter-feeders are filtering out and munching on their plankton meals, they’re also ingesting potentially toxic plastic particles. These microplastics are less than five millimeters long, are about the same size as a plankton snack. 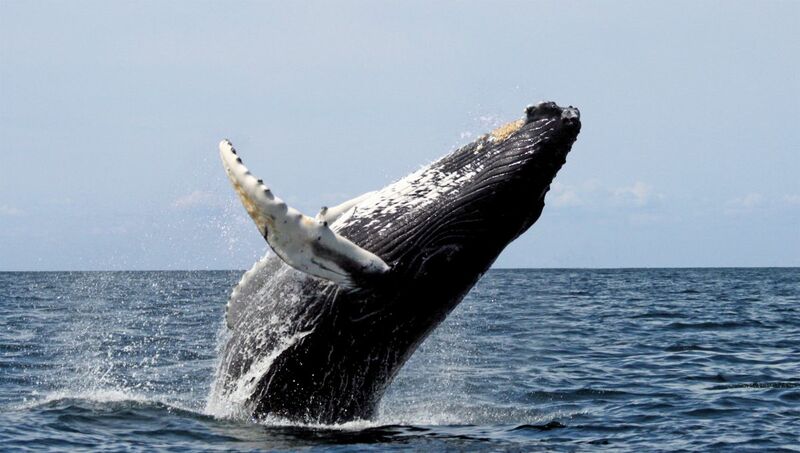 Baleen whale species, like the Humpback whale, ingest plastic when they filter plankton out of seawater. Image Credit: Wikimedia. Whale carcasses have washed up on shores around the world with large pieces of plastic waste in their stomachs, smoking guns in the case against growing plastic pollution. But microplastics are often overlooked. This study shows that large marine animals — already threatened by overfishing — are more at-risk than we thought. Microplastics can come from a variety of sources. These plastics can be the remnants of larger plastic pieces that degraded over time and broke apart in the water. But they can also come from everyday, household products that contain plastic microbeads, like exfoliating soaps and toothpaste. Solutions to the growing problem of plastic pollution aren’t as simple as “don’t wash your face with these soaps” or “recycle carefully.” Companies need to phase out products containing plastic microbeads, governments need to find ways to remove microplastics from the water, and groups like the Monterey Bay Aquarium need to continue educating the public about the issue of plastic pollution. Whales and sharks are the pillars of their ecosystems. If these large animals are pushed to extinction, it could irrevocably alter these delicate marine ecosystems.